Some say that Hammondsport, New York was the real life inspiration for the town of Bedford Falls, the setting of Frank Capra’s classic film It’s a Wonderful Life. The film chronicles the story of how families struggle to survive in a harsh world of impersonal economic forces and very personal hopes and fears. It’s one of the saddest films ever made and one of the most hopeful, too, since love and hope triumph over greed and despair in the end. Hammondsport’s real story, as chronicled in Thomas Pellechia’s new book, is as fantastic as Capra’s film, yet it is well-researched fact not dramatic fiction. Hammondsport was the center of the Finger Lakes wine industry starting in 1860 and the Taylor family’s wine company grew to be both its largest business and, in due course, one of the largest wine companies in the United States. Pellechia, a writer and journalist who lives in Hammondsport, plots the Taylor family firm’s dramatic rise to national prominence and then its precipitous fall. The book is well documented, as befits the product of a university press, but also very personal. As a resident of Hammondsport, Pellechia must see the consequences of Taylor’s rise and fall all around him every day. And the many in-depth interviews that form the core of the book give us a glimpse into the personal stories the parallel the corporate history. Wine drinkers in the 1970s could not avoid mention of Taylors and its brands. Wine drinkers today might never notice its remaining products. How did this happen? The big story is a familiar one. A successful family business expands and for a variety of reasons becomes a publicly traded corporation. The founding family eventually cedes control (does this sound a bit like the Robert Mondavi winery story so far?) and a string of corporate mergers and acquisitions follow. The most valuable business assets of the original company (which included Taylor’s effective distribution network, according to Pellechia) are exploited while the natural foundation of the business (vineyards and wine) deteriorate from lack of investment. I find the big story as Pellechia tells it very compelling, but I have to admit that the sub-plots attracted my attention, too, if only because the cast of characters is so interesting. 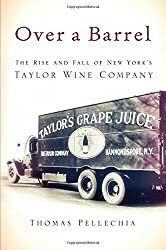 The first big corporation acquire Taylor’s, for example, was the Coca Cola Company, which made the New York company the cornerstone of its Interim Wine Group strategy, which expanded starting from Taylor’s New York base. Wine didn’t prove to be the synergistic business that Coke thought it would be and they spun off the operation. The Wine Group how thrives as a privately-held company, maker of high volume Franzia wines and a host of others brands including the very hot Cupcake line. It is the second largest wine producer in the U.S., according to Wine Business Monthly, with U.S. sales of 57.5 million cases. The Seagram Company was the next to take up Taylor’s business, but the Bronfman family soon shifted their focus from drinks to entertainment. Taylor’s was shuffled to Vintners International and then, in much weakened condition, to the Canandaigua Wine Company, which you will be more familiar with by its current name, Constellation Brands. Constellation is the #3 wine producer in the U.S. today , but at its peak a few years ago it was the largest wine company in the world. The New York Taylor brand still exists in the Constellation portfolio as a popular line of fortified wines (Taylor Desserts). Looking at that bottle of Taylor Port, it is hard to imagine the rise and fall that it represents for a family, a company and a regional industry and even harder to imagine all the lessons (about wine, family, corporations, economic forces and so on) that it represents. That’s why it is important to have books like Over a Barrel to make sure that the stories are re-told and the lessons not entirely forgotten. This book connected a lot of dots for me and I recommend it. Come back next weeks for more thoughts about family businesses and their importance in the wine industry. « Why Haven’t Corporations Crushed the Family Wine Business? IS 1,000 TO 1,000. PEOPLE NEVER LEARN. My friend Walter TXXXXR lived his life in wine at Bully Hill Vineyards in the shadow of this story. I can’t wait to read it! Bully Hill is indeed part of the story hold in this book. Wonderful book. Thanks for recommending it, Mike. Thanks for the review, Mike. I’ve been busy with a book that was just released and have been behind in following how the Taylor book is doing in the marketplace. Your review hist the nail on the head, regarding the intention of the book: to show the pitfalls and perhaps warn those who might be starting up or falling into a pitfall. Frankly, I was surprised that no one had written this book, since Taylor was such an important wine company. To any of your readers, I offer email access to answer any questions the book may have raised but did not get into. question : is wine bottled with a cork necessarily better than wine bottled with a screw cork? I just found a 35mm slide taken at Taylor Winery in August of 1961. It shows bottles being carried down a production line in metal crates suspended from hooks, each holding 8 bottles per crate. It is a rather artful image with a central focal point. If anyone is interested, please let me know. I just found another great slide with men working over vats of wine. – these slides are clear and sharp, as if they were taken an developed only days ago. I have some old Taylor Winery watercolor posters…scenes of Keuka Lake and vineyards. Are these now in the public domain? Can I reprint them without legal consequences? I have no idea about the copyright, David. Constellation owns the Taylor brand now. Sorry I can’t help with this. Interest? Indeed! Would love to see it. In mid September 1964 I spent two weeks photographing the Taylor wine company its harvest and the process of producing wine. I gave the Taylor wine company a few weeks later many of the photos but never did know if they used them. I’d like to include a photo of one of the Taylors putting the spent wine skins onto the Vineyards but I do not see any to do this. I have a bottle of pink champagne from Hammondsport wine company….. it’s old and I can’t find any information about it. I came across this link while researching and I now have to read this book! With that said, any tips as to finding info about my bottle? You might write to the people at Bully Hill winery — I think they have a museum and might have information. Sorry, that’s my only idea. Good luck. Do you possibly have any information about Taylor Pink Champagne?